The sweeping naval exercises were conducted for the first time since China built strategic outposts in the sea, which is seen as a crucially important waterway for international trade. American and British warships have sailed together for the first time in the disputed South China Sea, in six-day joint military drills, the US Navy’s 7th Fleet said in a statement, which went on to specify that the exercise covered “communication, division tactics and a personnel exchange designed to address common maritime security priorities, enhance interoperability, and develop relationships that will benefit both navies for many years to come”. The drills in the strategically important waterway involved the guided-missile destroyer USS McCampbell and Royal Navy frigate HMS Argyll, and are the first ones since China built a number of artificial islands in a bid to strengthen its position in the region, with Beijing citing defensive purposes. “We routinely train with regional allies and partners, but it is a rare opportunity for my team to work with the Royal Navy”, Allison Christy, the McCampbell’s commanding officer, said in a US Navy statement. 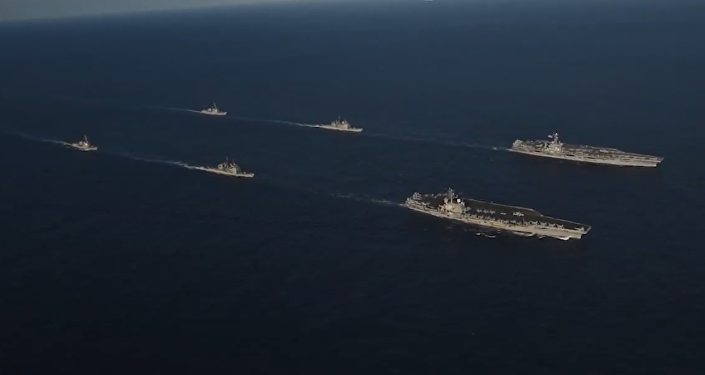 The move came shortly after a trilateral anti-submarine warfare exercise between the US Navy, UK’s Royal Navy and the Japanese Maritime Self Defence Force on 21-22 December. Also, earlier this month the same ship, McCampbell, passed within 12 nautical miles of the Paracel Islands, which are claimed by mainland China, Vietnam and Taiwan, in a move that the US Navy referred to as a freedom of navigation exercise meant to “challenge excessive maritime claims”. Last August, another British ship, the amphibious assault vessel HMS Albion, came close to the same island chain, with the incident closely followed by another one, in which US and Chinese warships were on the verge of colliding right off the Spratly chain. Addressing China’s claims in the region, President Trump signed the so-called “Asia Reassurance Initiative Act of 2018” into law late last year. According to the White House, the legislation, which authorises $1.5 billion to counter China's strategic influence worldwide, establishes a multi-step strategy for advancing US security and economic interests in the Indo-Pacific region. With this regard, a Washington-based think-tank previously warned that the US Navy was at risk of losing its crown as top powerful, given challenges "posed by great powers like China and Russia". China and half-a-dozen other countries, including Brunei, Indonesia, the Philippines, Malaysia, Vietnam, and Taiwan have competing claims over parts of the South China Sea, a strategic and economically crucial waterway, which includes vital sea lanes through which about $3 trillion in global trade passes annually.